Update: >> this is the best scanner ever! With each passing month, new technologies and products that are intended to simplify or streamline certain aspects of our lives, debut on the marketplace. This has allowed us, as individuals, or even as business owners, to leverage the positive benefits of the various organizational technologies that make our lives more efficient, reliable, and accurate. One of the most key areas that need organization is our financial lives. This, however, can be time-consuming and frustrating. Individuals and small business owners can take advantage of certain tax breaks or credits, but only if they have kept the appropriate documentation related to purchases they made, payments made, monies received, etc. This is why so many people save their receipts all year – it will ultimately allow them to recoup more of their money or reduce their overall tax burden with the federal government. While this sounds simple in theory, it can actually be a frustrating mess. Just think of all the purchases you make each year. That adds up to a lot of receipts that you somehow need to keep track of and organize. This is where new technology comes in to save the day and relieve you of this tedious burden. With gadgets like a receipt scanner, you can easily scan your receipts as you collect them and then get rid of the paper copy. At the end of the year, all of your receipts will be conveniently stored for later use. Many people may not be familiar with receipt scanners, how they work, what they do, what their benefits are, and so on. What follows is an in-depth guide that provides detailed information about the ins and outs of receipt scanners, as well as a brief description guide for ten of the best options currently available on the market. Receipt scanners are what the name implies, they are hardware or software tools that are designed to scan receipts and other like financial documents. Depending on the size and nature of your organization or personal needs, will determine what type of receipt scanner will work best for you. There area lot of different “bells and whistles” that you may or may not need. This underscores the importance of understanding the basic use, workings, and features to look for on a receipt scanner so you do not end up buying something that is inadequate or way more advanced than what you need. There are standalone receipt scanners that are specifically designed for this use. They can be larger and stationary, or smaller and portable, allowing you to use this technology on the go. For people or business that already have a good scanner, you can get targeted software that makes storage, management, and security of your receipt data with ease. This allows you to go paperless, have a more secure document storage solution, and reduce the need for space to store all the varied receipts you collect during the course of a year. Technology has come a long way and depending on your budget and specific needs, you may choose a more basic or advanced models. Receipt scanners are available across a wide range of prices depending on included or desired features or functionality. The standalone receipt scanner is a mini scanner that you feed your receipts into to be scanned and saved for later use. This allows you to scan the receipts as you collect them, rather than trying to have to keep them together and organized for the whole year. With a receipt scanner, you help to ensure accuracy and that you get every tax break or other incentive that you or your business may qualify for. There is an added security of having digital copies of these important documents, rather than keeping track of a paper stack of receipts. Once the receipts are scanned into the system, one can easily shred the paper copies and destroy any personal and/or financial information that could get into the wrong hands. Just like with traditional printers and scanners, there are a lot of different features that are available with receipt scanners that can enhance its functionality and utility. Later in the guide, we will briefly look at a few top models of receipt scanner and discuss the advantages and disadvantages of each model we look at. We hope that this information and these recommendations will help make the choice of what type of receipt scanner as simple as possible. In the end, you want the device that will work best for your needs, that is also a value. In short, you want something that does the job but does not break the bank. Many people – small business owners and salaried individuals alike – fail to take advantage of the many tax breaks and deductions that are available to them. This allows them to reduce their taxable income and thus reduces one’s overall tax burden. In turn, this translates into lower tax liability and thus more money in you and your family’s pocket. It may come as a surprise the things that can be written off as business- or work-related expenses. All you have to do in order to claim these deductions is to be able to provide proof that you purchased some goods or services as part of the course of your job duties. In short, this means that you have to keep your receipts – this is the documentation that proves that you made said purchase and thus it can be used to reduce your overall tax liability. While many people assume that, as middle class or working class people, there is nothing for them to write off. It helps to take a look at the tax code and the ever-changing rules on what can and cannot be claimed as a deduction. Many tax professionals state that we end up paying countless sums of money in taxes that we wouldn’t have otherwise paid, had we simply kept our receipts and done a little homework. As an individual and small business owner, there is also the chance that you could find yourself or your business being audited. This is an in-depth investigation into the mundane details of your (or your business’s) financial information. Having receipts stored on file helps to make the process run more smoothly and quickly and can allow one to easily reconcile any potential red flags or discrepancies that may come up in the course of the process. Keeping receipts is also beneficial for in-house financial management as well. When you keep your receipts, you have at your disposal a wealth of information that can help one predict trends in expenses, find ways to cut cost when one sees room for improved efficiency, and more. Say you run a business that requires its employees to travel a lot in the course of their job duties and allows them to claim miles for compensation or tax write off purposes. Having all of the employee’s fuel and mileage receipts allow you to quickly determine what your overall burden, expenditures, and more are on this aspect of your business. This can also be helpful for simply controlling the cost of office supplies – there are many areas in which we can improve efficiency when we see that there is waste. These are, of course, not the only benefits of keeping your receipts, but they do illustrate that varied and potentially money-saving benefits to keeping track of your receipts. And with a receipt scanner, you don’t have to worry about keeping hundreds of paper receipts in a safe space. All your information is stored digitally, which allows you to easily look at your financial information and utilize it for action planning and cost savings, or simply just as a means to gauge annual spending on certain elements of running a business. A whole book could be written just tackling the benefits of keeping receipts for strategic planning, financial administration, and more. More and more people and businesses are looking for ways to not only reduce cost, but also to reduce the negative impact that we have on our environment. With each passing year, we learn more about the alarming and often negative consequences our daily lives have on our planet. Due to these concerns, more offices are looking for ways to go green, improve efficiency, and employ practices that have less of an impact on the environment. Individuals too are also looking for ways to reduce their carbon footprint and become more efficient in their use of resources. There are a few obvious areas that most of us can streamline or change our means in a way that is less wasteful and more efficient. These are the areas of energy use, resource use, and so on. Just within the two stated niches, there are a huge wealth of ways that you can be more efficient and reduce the burden. This is why so many people and companies have made small but lasting changes that have had a positive impact on the environment. One of the unintended benefits of these actions is often a reduce in overhead costs. This means efficient homes and businesses cost less to power and require fewer resources to run at their optimal level. It should be noted that there are a huge number of pragmatic reasons to go paperless as well that have nothing to do with environmental friendliness. It is just plain more efficient to go paperless and to utilize tools like receipt scanners than it is to do these things by hand. You reduce the amount of time it takes to track and file receipts and other financial documents. You increase the level of security of your documents by having the in a remote place that is not subject to loss due to error or even something like an office fire. Just think — you are asked a question about your financial expenditures. Think of how much easier it is to search for this on a computer or tablet, rather than rifling through stacks upon stacks of paper receipts to find what you are looking for. This streamlines your ability to provide information to customers, to use for personal financial purposes, taxes, compliance and more. It is also more cost effective that have a piece of hardware or software, rather than the physical space, manpower, etc., that you need to manage paper receipts. Being paperless not only reduces our impact on our environment and has the potential to improve accuracy, reduce costs, and increase security. It also helps to put forth a more professional image. To be able to quickly retrieve a financial document for an audit or customer request and to supply it in a digital format, rather than a crumpled receipt, gives off a much more professional and organized vibe. This is always good for reputation enhancement and is one of the unforeseen ways that things like receipt scanners can actually boost your standing. When your documents are digital, rather than stored in physical, paper form, it makes it far more accessible to you and other people who may need it. A lot of receipt scanners have software that allows for remote access to the documents that have been scanned on the device. What this means is that no matter where you are, you can have access to the information that you need on your computer, smart phone, or tablet. In times past, we would have to drop what we’re doing and run to the office or filing cabinet to search for what we need. There are a number of security reasons for going paperless as well. When you have a digital storage option, you can back up the docents at a variety of remote locations which allows for duplication and reduces the risk of losing important data. Storing the documents in this manner is also more secure. They can be password protected to help ensure that only people who have permission have access to said files and documentation. You can also back up your files in more than one place, remotely, which provides additional layers of security that your data will be safe and protected, regardless of what happens to the physical space one works in. A flood or office fire could spell financial disaster to the business who keeps only paper copies of their financial transactions and records. There are so many reasons that people are transitioning to a paperless or mostly paperless office environment. It is more cost effective, it looks more professional, it makes the financial data you need easy to access no matter where you are. It allows you to answer queries and perform financial tasks like taxes fast and accurately. Digital copies of these thing make the data more accessible while also more secure. It is also something that people and businesses can do to help reduce unnecessary strain on the environment. Paper copies equate to trees that were logged for paper that could have been saved had we chosen digital copies instead. When we save documents digitally, we are using less energy and fewer resources. When it comes to receipt scanners, which are probably more accurately called document scanners, there are a whole host of different types and available features. What will work best for you will depend on your needs and your budget. There are tons of high quality models that are great values or the money and they make getting organized and going paperless as simple as it has ever been. If you do a lot of traveling or need flexibility and the ability to travel for your scanner, a portable scanner is likely the best option available. These are small and thus aren’t conducive to scanning a large number of documents with speed and ease. However, they are great for the person who is on-the-go a lot and needs to be able to scan their receipts and other documents where they are, rather than waiting to get back to the office or your home. As they are portable, they are battery operated and the cost and battery life varies pretty dramatically across different models. If you have more “heavy duty” scanning needs, the portable scanner is not likely to be your best option. If you just need to scan a few receipts at a time and need to convenience and portability, this type of scanner will be well suited to your needs. Desktop scanners are standalone units that are well suited for an office that scans a lot of documents on a regular basis. These are not designed for portability, but for more heavy and regular use. They tend to be larger and designed to be used on a desktop or solid surface. With a desktop scanner, you have more options for auto feeding of paper, as well as the ability to queue up a large number of documents to be scanned without someone having to stand there and manage the whole operation. For busy offices with lots of scanning needs, this is a great option, but it should be noted that these devices to not have utility beyond being able to scan. If you want a more functional scanners, an all-in-one may be more suited to your needs. As the name implies, an all-in-one scanner offers a variety of different features within the same device. These, like desktop scanners, are standalone units that are not designed for portability. If you have a limited budget, lesser scanning needs, or space constraints, an all-in-one scanner is a great choice. An all-in-one has functionality beyond scanning. These devices often have printing capabilities, copy machine functionality, and even act as fax machines. As they have a wider utility, these do not tend to be the most high quality scanners. They do the job, but for offices that need high quality scans and the additional functionality you get with a desktop, this model is a bit lacking. For the home user or small business owner, an all-in-one might be the most fiscally sound option. There are also specialty receipt scanners that are designed for a specific purpose. This may include small devices that are only intended to scan receipt-sized documents. There are others that are designed to scan business cards and other similar sized items. If you need something in particular, a specialty scanner is likely the best option. When deciding between the different types of scanners, you need to have a clear idea of what you will be using the device for, as well as your budget. If you only need to scan receipts on occasion, or are using the device as part of a home office, an all-in-one might be the best and most fiscally-prudent choice. If you travel a lot for business or work remotely, a portable device might be the most attractive option as it makes keeping track of your receipts simple, even when you are on-the-go. For larger businesses and those that rely on a lot of scanning, the desktop or specialty model is likely to be the best option. These are more heavy duty models that are designed for heavy use. They provide some of the highest quality scans and have the most available features for automation and other time-saving measures. First and foremost, when you use receipt scanners, you save money and resources. It reduces the need for physical storage space, as well as ink and other subsidiary items that further increase the cost of keeping and storing records. There is an added level of convenience that having a receipt scanner provides. Rather than having to track down file folders or have your employees carry around stacks of receipts, they can all be collected and stored digitally. The receipts are stored as digital files which can then be accessed remotely, providing added convenience for compliance or other types of reporting requirements. It allows you to look at all the year or month’s receipts with a few simple actions. When you use a receipt scanner, you also improve the accuracy of your bookkeeping and ensure that you are able to receive as many tax credits or breaks as are possible. With the ability to simply scan a receipt and move on, it is incredibly convenient for employees to keep track of their expenditures, as well as for accountants to ensure that they get all the deductions possible on your personal or business taxes. With a receipt scanner, you don’t have to worry about losing a receipt or storing it in the wrong place. Information is stored digitally, which also reduces the risk of human error. There’s a lot to be said for the professionalism of being able to provide documentation when it is requested. With digital receipts stored remotely with the use of a receipt scanner, you can easily access financial information quickly and easily. Having said information in a convenient digital format provides a more professional presentation as well. This allows you to more accurately keep track of expenses, while also making you as an individual or business owner to look more organized and in control. Receipt scanners are not just for use with receipts, making them a versatile and flexible piece of hardware. These devices can also be used to scan contracts, forms, and other forms of compliance reporting-related paperwork that you or your business might need to keep track of throughout the year. Keep solid and consistent records is a best practice for an individual or business owner alike. This makes any potential legal issue simple to handle and also keeps your legal and financial documents well organized and easy to access. There is no shortage of high quality receipt scanners across all types with varying ranges of features. The models described below cover all types of receipt scanner – portable, desktop, all-in-one – and provides at least the beginnings of an idea on where to find the best scanner for your budget and needs. 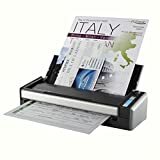 The models reviewed below are all high quality scanners that are good values for the money and are sold by reputable companies with a time-honored history of providing the best office products on the market. Any one of these models will provide excellent results and make it easier than ever before to keep track of your financial and other important documents with convenience and ease. Whatever scanner you ultimately choose, you will be glad you did. These time-saving devices make it simple and convenient to keep track of spending, expenditures, miles traveled, contracts signed, and more. These devices allow you to have access to these important documents even when you are on-the-go. Brother is a trusted and reputable manufacturer of high quality and durable office products. Their ImageCenter line of desktop scanners is one of the best desktop scanners available on the market. The device is a standalone desktop scanner that is designed for performance and efficiency. This is a great option for busy offices and those who do a lot of scanning. The ImageCenter series of devices offer high speed, high quality image scanning. The ImageCenter can scan in color and even has the option for two-sided scanning, which helps to save paper and other resources. The ImageCenter can hold up to 50 sheets of paper at a time, making it perfect for larger scanning jobs. The scanner can also scan color photos, business cards, ID cards, and more. You can even “scan to” your desired location, such as via email or flash drive. This model offers a variety of advanced features that reduce waste and lead to a more high quality scan. It has protections that help reduce the potential for jams. It has software that allows the removal of backgrounds or blank pages in the scanning process. These scanners have easy-to-use software and are compatible with Windows and Mac systems. Epson is another company that has a long history of making some of the best home and office products on the market. Their WorkForce line has options that are suitable for small businesses, folks on the go, and even large businesses who need heavy duty functionality and large run capabilities. The WorkForce is a line of all-in-one devices that have the ability to scan documents, copy documents, act as a fax machine, as well as a traditional printer. This means that it has more limited functionality when it comes to specific scanning options, but for most people’s needs, an all-in-one from a company like Epson will work well for most needs. These are affordable devices that allow for large runs of printing and scanning – some models having the capacity for almost 600 sheets of paper at a time. This line allows for easy printing from a desktop computer or mobile device. With the WorkForce line, you will be able to scan in color, in duplex, and double-sided. This makes it a highly versatile device that has a wide range of uses for most home and office needs. The WorkForce line also includes the ability to connect the printer via Ethernet cable or using wireless/wi-fi technology. Doxie is an up and coming name in the scanning and printing industry and they have shown a penchant for cutting edge mobile technologies that make being organized on the go easier than ever before. The Doxie Go line of portable scanners is an award winning line of scanners that make going paperless and remote an attractive and viable option. The Doxie Go line of scanners are portable scanners that do not require a computer interface for their use. These are rechargeable devices that work as a standalone device and can be used anytime, anywhere. All you have to do is turn it on and insert the document to be scanned. One of the biggest benefits of the Doxie Go line is that it is an affordable, high quality, and well designed line of portable scanners. The Doxie Go line includes small, lightweight scanners that are roughly the size of a rolled up magazine, making them well suited for regular transport. The included software is secure and easy to use, earning the Most Popular Scanner title from the personal privacy company Lifehacker. This means that even though you are scanning documents on the go, in the thick of the action, you can be sure that your personal information is safe and secure. The Doxie Go line works well and can be integrated with mobile devices such as smart phones and tablets. TaoTronics is another great maker of high quality office products with an emphasis on convenience and portability. They offer a unique, hand-held scanning option that is perfect for the person who needs to be able to scan a variety of things, on the go. The device is small and lightweight, making it easily to slip into a purse or briefcase for easy travel. This device makes it simple and convenient to easily scan a variety of documents, no matter where you are. It has the ability to scan color or black and white. It can scan photos and standard printer sized documents with ease, allowing you to easily convert your important documents to digital files that can be backed up and accessed remotely. The TaoTronics portable document scanners renders your receipts and other documents in high quality, high resolution and even allows for scanned documents to be edited after being scanned. This is a great value for the money and is perfect for the individual on the go. Fujitsu is another key player in the high end office supply providers. They have a long history of providing high quality products that are a great value for their price. Their ScanSnap line of scanners are no exception. This is a varied line that offers desktop and portable scanners that are cutting edge and simple to use. The ScanSnap line is a heavy duty line that was designed for regular use. The desktop models are high speed scanners that can scan in color or black and white, as well as in duplex. These are high speed desktop scanners that can print a lightning fast 25 pages per minute. Their portable scanner within the ScanSnap line is also a heavy duty and versatile scanner. It is one of the fastest portable scanners, boasting a speed of 5.2 seconds per page. It can scan in color or black and white and even has the ability to scan business and ID cards, on the go. This line of scanners is mainly focused on portable scanning and offers a number of different portable options with functionality that is specially tailored towards specific uses. These are great specialty scanners that provide added utility and convenience. The Neat Company has a history of providing high quality organizational solutions that can be easily scaled for both home and office use. The NeatDesk desktop scanner is one of the best desktop scanners available on the market today in its price range. There has never been a better time to go paperless than now. With the NeatDesk desktop scanner and home filing system, you can eliminate paper usage. This is a versatile scanner that can scan receipts, regular papers, and even business cards in the same batch. There is no need to separate your different documents before scanning. Your files are stored digitally and remotely, which allows you to easily back up your files for added security and access said files any time, anywhere from a computer or mobile device. This device also has a “send to” function that allows you to easily send data scanned to Excel or even your preferred tax tracking and compliance software. This makes taxes and financial reporting incredible simple and easy. The NeatDesk scanner was designed for regular use and is built for speed and durability. It can scan in color and black and white and is known for its simple interface and ease of use. This is another high quality option brought to you by the Neat Company. The NeatReceipts mobile scanner is a high quality, affordable portable scanner that makes keeping track of receipts and other important documents simple, even on the go. The NeatReceipts scanner is both lightweight and durable. It easily fits into most purses or briefcases, making it convenient to keep with you at all times when on the road. It is a portable scanner that can also be powered using the USB drive on your computer. The included software makes it simple to store and create reports using the data scanned. It makes it simple to generate financial documents and compliance reports and also makes it as easy as a few clicks to export your data to your favorite database or tax software like Excel or TurboTax. The Neat Company also has what they cal the NeatCloud which is a remote cloud that allows you to safely store all your information and data remotely, which allows you to easily access your data from the cloud no matter where you are. With NeatCloud, you also get NeatCare support for any sort of technical or user support issues, as well as protection against damage to your scanner as long as you are a member of the NeatCloud. Another great and versatile line of scanners from the trusted and reputable Epson brand is their perfection line. This line is best described as somewhere between a desktop and a specialty scanner. The line consists of standalone devices that are flatbed scanners that are perfect for using to scan receipts, pictures, business cards, and more. The Perfection line boasts high speed scanning with high resolution, creating crystal clear scanned images that are easy to use and read. This is an affordable scanner that is suitable for home and small- to medium-business use. It is durable and built to last. The Perfection line is very well suited to scanning a variety of types of photos, from traditionally sized photos to ID cards and larger images. The system is supported via Mac and Windows and boasts easy to use software that makes accessing and manipulating your files as easy as a few clicks. Canon is another well known and trusted brand of small office and related products like cameras. Their CanoScan line of desktop scanners are cutting edge, high end scanners without a high end price tag. For the money, the CanoScan series is one of the best buys when it comes to value and quality with desktop scanners. The CanoScan line of scanners features flatback scanners that are compatible with Windows and Mac operating systems. Unlike other models, the CanoScan line needs no warm up time and can begin scanning as soon as the device is turned on. The CanoScan line of scanners can scan black and white, as well as color images. One of the special features of this line is the built-in retouching and correction software included with the system. This means dust and smudges can easily be removed and pictures are easily retouched. The scanner also has the ability for auto scanning, which means you can set up a queue of documents to scan and leave the scanner to do its thing. Panasonic is a long trusted manufacturer of a variety of electronic gadgets from scanners and printers to televisions and radios. It has a time-honored history of providing high quality products that are at the leading edge of new technology. The KV-S7097 is one of the best high end scanners available today. This model is one of the pricier models and some may have sticker shock when they first see the price tag. For those who want the best of the best and have a more flexible budget, this is one of the most highly recommended models for clarity and quality. It is a high speed and large capacity model of scanner, making it perfectly suitable for larger businesses that need to do a large volume of high quality, easily automated scanning. Not only can the KV-S7097 deliver fast and incredibly clear scans, it can also handle mixed media runs of scans. This means that receipts, pictures, bills, and even standard-sized paper can all be queued up in the same batch process. Regardless of which model you choose, there are so many benefits to receipt scanners that even salaried workers who do not own their own businesses can truly benefit from their use. These are affordable products that allow for improved accuracy, convenience, and even potential cost savings to all who use them. No longer do you have to keep a file or envelope full of grubby receipts in order to get tax and other fiscal relief via work-related expenses. When you use a receipt scanner, you simply scan the paper receipt and a digital copy is rendered using the associated software. This provides a digital copy of the paper receipt, which reduces the need to store countless stacks of receipts for months on end in order to utilize the tax liability reductions on may qualify for. Receipt scanners also make tax time and compliance reporting much simpler than if you keep paper receipts. When you go digital and paperless, you create digital copies of your files that can be stored and accessed remotely. What this means is that you have access to this important information, even when you aren’t at the office. It makes it fast and simple to see all your potential deductions, as well as to use said information in strategic or budgetary planning. There are tons of different types of receipt scanners that fit a whole host of different needs and budgets. The models described here are but a taste of the quality, high value options on the market. Whichever you choose, these devices make it easier than ever before to keep and track spending for a variety of purposes. The added security of remote storage and the ability to back up your information provides peace of mind that the information you need is there when you need it. The convenience also makes it more likely that people will actually keep their receipts and take advantage of the varied deductions and other tax breaks that this documentation allows them to qualify for.